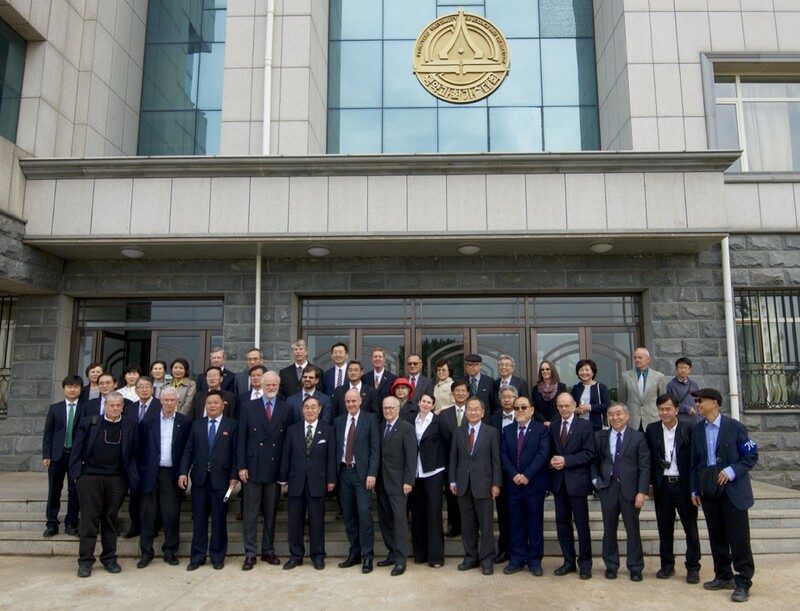 According to a press release put out by PUST, Professor Aaron Ciechanover (Chemistry 2004), Professor Finn Kydland (Economics, 2004), and Dr. Sir Richard Robert (Medicine, 1993) visited the campus in Pyongyang. You can read the press release for additional information. Nobel medicine prize winner Richard Roberts, Nobel economics prize winner Finn Kydland and Nobel chemistry prize winner Aaron Ciechanover have described how United Nations sanctions and a lack of internet access are hampering North Korean scientists. Speaking to reporters following their visit to Pyongyang, the three laureates from Norway, Britain and Israel called for a rollback of many of the international restrictions that have been placed on the Communist state. Roberts described how North Korean academic institutions suffered from a lack of modern scientific equipment. He said restrictions on internet use prevented most scientists from collaborating with colleagues in other countries, or accessing the latest scientific literature. “So this embargo is really hurting the scientists in some major ways, and I think that’s a great shame,” Roberts added. He said there was a strong desire for more international exchanges. During the trip, at least two North Korean students were invited to the West. The Western scientists visited hospitals, universities and research institutes in Pyongyang and met with students and academics. They described clean and modern facilities – a stark contrast to other accounts, which describe the country as brutally impoverished. The trip, which has been described as an exercise in “silent diplomacy,” was planned more than two years ago with help from the International Peace Foundation (IPF). In turn the Vienna-based organization received an unsolicited email from the Korean National Peace Committee. Notice that Kydland, the economist, is not quoted in reference to the sanctions. UN Sanctions do not impede economic or social progress so much as North Korea’s actual economic, trade, and investment policies. North Korea has only itself to blame for the state of its economy. Finally, there is no UN embargo on the DPRK, only targeted sanctions on entities that all members of the UNSC agree are involved in the country’s weapons programs. The US, but not UN, has imposed an embargo of “dual use goods” going to the DPRK, but this is aimed at the country’s military, and applies to countries other than the DPRK. But the laureates suggested Saturday that the United Nations sanctions imposed on the North because of its nuclear program should be eased. At the Okryu Children’s Hospital in Pyongyang, a showcase medical center that Kim Jong-un visited during its construction in 2013, Mr. Ciechanover said that there were 300 beds and a capacity for 300 outpatients, but that doctors administered only about 60 tests a day, a low figure that he attributed to the sanctions. Doctors faced shortages of medicine and took the view that “you give only what you have to,” he said. The United Nations sanctions do not apply to medicine, but they restrict the North’s access to foreign currency, and the government is known to channel its limited resources toward the military. Also, some BBC reporters covering the PUST visit were expelled. Here is coverage on KCTV. On Wednesday 19th November, the Pyongyang University of Science and Technology (PUST) held its second graduation ceremony of 2014, at the campus in the south side of Pyongyang. 100 undergraduate students in science and technology received Bachelor degrees from the co-Presidents of PUST, in the presence of foreigners and diplomats including ambassadors from Europe, Asia and Latin America and UN representatives. These new graduates are the first year-group of students, who came to PUST in October 2010, when the university began classes in electrical and electronic engineering, computer science; agriculture and life sciences; and finance and management. Some will remain at PUST as graduate students and most others will go to various DPRK state universities for further study. PUST is also active in sending graduate students for both short-term and long-term study abroad, at European and Asian universities, under various partnerships and scholarship schemes. For more details please see the Press Release (PDF). UPDATE 1: Hat tip to a reader in the commentsection…Mr. 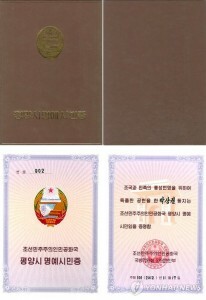 Park was given honorary citizenship to the city of Pyongyang, not to the DPRK. This is the DPRK equivalent of getting the “key to the city”. This award was given to the head of Pyonghwa Motors (now for sale). The head of inter-Korean automaker Pyeonghwa Motors said Tuesday that he was made an honorary citizen of Pyongyang late last year to reflect his contribution to North Korea’s development. In an interview with Yonhap News Agency, Park Sang-kwon said he received the citizenship at the Mansudae Assembly Hall in the North Korean capital on Dec. 18. Park has led the carmaker that started off as a joint venture between South Korea’s Tongil Group, run by the Unification Church, and North Korea. Production began in 2002, with the company producing about 2,000 vehicles every year. He said his citizenship has a serial number of 002 and has an inscription saying that the honor is being bestowed because of his contribution to the fatherland and the Korean people. He is the first foreign national to have received the honor under the communist country’s new leader Kim Jong-un. Kim Chin-kyung, the Korean-American president of Pyongyang University of Science and Technology was the first to receive an honorary citizenship in Aug. 2011 by late North Korean leader Kim Jong-il. “The reason why they gave me the citizenship reflects recognition for the trust I have shown them and may be a sign that they want me to more freely engage in business activities,” he said. Park claimed that the citizenship can be seen as a sign that the North will allow him to start a new business in the country. He then said that the reason why Tongil decided to turn over management of the carmaker last November was so it could focus on a wholly-owned business operation in the country. Last year, the business group created by late Rev. Moon Sun-myung also agreed to hand over control of the Pothonggang Hotel in Pyongyang. The executive said he had asked the North to approve such a step. “Pyeonghwa Motors has been generating profit for the past five years,” Park said. The businessman said that in the future, he wants to engage in the distribution of household necessities in North Korea, and in particular to Pyongyang. He said there is a need to show that a wholly-owned (outside-invested) company that is not tied to a joint venture project with a North Korean partner can succeed in the country, which can act as an incentive for other foreign companies to invest. He pointed out that Chinese companies that invested in the North are generally those that have not done well at home. He said that successful South Korean, Japanese and U.S. companies need to engage in business activities in the North. “If 200 competitive South Korean companies operate in the North, there would be no reason for inter-Korean tensions, and it can actually help push forward the unification process,” he said. Park, meanwhile, said the North is looking into the option of developing a ski resort near the 768 meter high Masik pass near the city of Wonsan on the east coast. He said that United Front Department of the ruling Workers’ Party of Korea mentioned the development plan in December and claimed that North Korean leader Kim Jong-un gave the order personally. Kim has been running the country since the sudden death of his father Kim Jong-il in Dec. 2011. “The North seems to want to develop a small ski resort first and build this up depending on demand,” he said. The businessman added that Pyongyang wanted to transform Wonsan into a special tourist zone and is interested in using a military airfield near the city to accept civilian flights carrying tourists. Wonsan is famous for its beaches and if a ski resort is opened on Masik pass, it could attract tourists year round. Park claimed Kim Jong-un has gained confidence in managing the country in the last year and may move to increase investments into the tourism sector. Currently 300 undergraduate and 70 graduate students are enrolled in the PUST’s three departments: electronic and computer engineering; international finance and management; and agriculture and life sciences. Thirty computers, with access to the Internet, are available for graduate students. At least some of those computers seem to be made by Chinese subsidiaries of South Korean electronics giants Samsung Electronics Co. and LG Electronics Inc., he said. The goal of the university is to nurture personnel capable of working in the international community. About 50 professors from Europe, the United States, Australia and elsewhere give lectures in English, with the content of the courses left to their discretion, Park said, and lectures on economics include finance, investment, insurance, equity and trade in Europe and the United States. The students at PUST are selected from among those who have studied at least two years at the country’s top universities, including Kim Il Sung University and Kim Chaek University of Technology. Students live in a dormitory, and tuition and living expenses are free. Each student is given a monthly allowance of $10 (790 yen) in card form, which they can use to purchase daily commodities and school supplies at a campus store. When a large number of the country’s students were recruited for construction work and other projects in preparation for the 100th anniversary in April of the birth of North Korea’s founder, Kim Il Sung, PUST students received special exemptions. In September the university plans to send the first three students to study at a British university. The story also reports “a business school in Pyongyang founded by a Swiss investor is proving popular among bureaucrats and corporate workers,” but I heard as recently as last week that this endeavor has not been operational for a few years. Read previous articles on PUST here. The first university founded jointly by South and North Korea is scheduled to open next week in Pyongyang, a school official said Friday. The project to build Pyongyang University of Science and Technology was launched in 2001 after the two countries’ governments approved a South Korean nonprofit organization to participate in it. The university’s stated aim is to promote reconciliation and prosperity among the Korean people, separated since the 1950-53 Korean war, and “help North Korea develop the necessary economic and intellectual infrastructure to function as a member of the international community,” according to its Web site. “All the facilities and staff are ready, and we will officially open (next Monday),” said James Chin-kyung Kim, the school’s founding president and co-chairman. Kim, a U.S. citizen, also founded the Yanbian University of Science and Technology in the Chinese city of Yanji, a major Korean-Chinese population center. “In time for the opening, 17 foreign professors will fly to Pyongyang from Shenyang (on Saturday). These professors come from the U.S. and Europe,” he said. South Korean staff will also be able to teach, starting next semester, according to the school. Instruction will be in English, and 160 students have been selected for the school’s undergraduate and master’s degree courses in agriculture, information and communication technology, and industry and management. Forty doctorate-level students began studying with four foreign academics in the summer. The university plans to increase the number of students to 500 and open more departments to teach architecture, engineering, construction and public health care. Here are previous posts about PUST including satellite imagery of the facility’s construction. 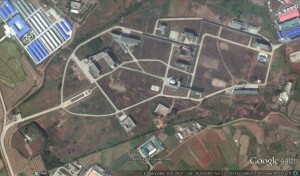 Google has updated satellite imagery of Pyongyang so there are some interesting developments to point out. I will spread these out over the next few days, but I thought I would begin with the Pyongyang Univeristy of Science and Technology. If you open all the images in the same browser you can view them as overlays. Here is the university’s Wikipedia page. Here are previous posts about PUST. 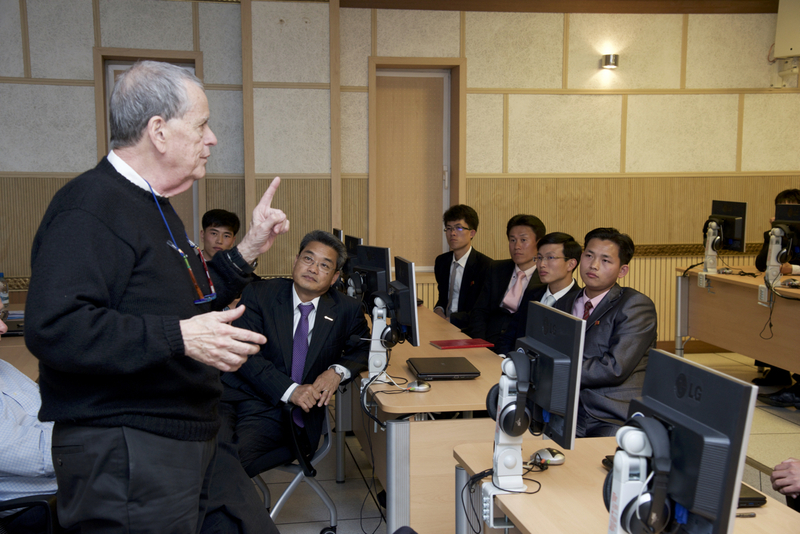 A Rice University professor has paved the way for a private university in North Korea. 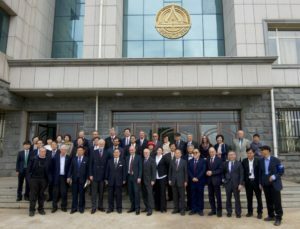 Malcolm Gillis, the Ervin Kenneth Zingler professor of economics and professor of management, is part of a four-person committee that founded the Pyongyang University of Science and Technology, which will open next spring. Members of the committee include founding President James Chin-Kyung Kim; Chan-Mo Park, former president of Pohang University of Science and Technology in South Korea; and Jung Bae Kim, former president of Korea University. 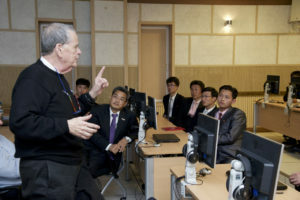 Gillis, who was president of Rice from 1993 to 2004, said the project goes back to 1997 when he met with the late Kim Dae Jung, then president-elect of South Korea, to engage in peace talks between North and South Korea. PUST will offer programs for information technology, industry and management, and agriculture studies, with plans to open new schools for architecture, engineering and public health in the near future. “North Korea is stumping for opening this university,” Kim Jin-kyung, co-president of the Pyongyang University of Science and Technology, said, returning from a three-day trip to the North Korean capital. “There are many difficulties, but we are aiming to open the school within this year,” Kim said. He is also president of the Yanbian University of Science and Technology, run with South Korean non-governmental funding, in the Korean autonomous prefecture of Yanbian, northeastern China. The school seeks to first accept 150 students in the fields of information and communications engineering; agricultural biotechnology and food engineering; and industrial management, he said. All lectures will be in English, and students will be required to meet the paper-based TOEFL score of 550, Kim said. North Korea has already recruited prospective students among “carefully chosen elites” who studied at top North Korean schools like Kim Il Sung University and Kim Chaek University of Technology, he added. Park Chan-mo, a science and technology advisor to President Lee Myung-bak who attended the completion ceremony with Kim, said Seoul is supportive. “The fact that (the government) gave permission to the North Korea trip shows it has a will to lend support,” Park said. The school will be reportedly co-headed by North Korea’s vice education minister, Jon Kuk-man. North Korean media reported the South Korean delegation’s departure earlier Thursday. Pyongyang, September 16 (KCNA) — A ceremony for the completion of the first-phase construction of Pyongyang University of Science and Technology was held Wednesday. Present there were Jon Kuk Man, vice-minister of Education, officials concerned and members of a delegation led by Chin Kyung Kim, founding-president of the university. After a certificate on nominating the co-managerial president of the university was conveyed to the founding-president, the participants looked round the building of the university completed as the first-phase construction. James Kim, an American businessman turned educator, once sat in the very last place that anyone in the world would wish to be: a cold, dank prison cell in Pyongyang, the godforsaken capital of North Korea. Kim, who had emigrated from South Korea to the United States in the 1970s, had been a frequent visitor to Pyongyang over the years in pursuit of what, to many, seemed at best a quixotic cause. He wanted to start an international university in Pyongyang, with courses in English, an international faculty, computers, and Internet connections for all the students. Not only that — in the heart of the world’s most rigidly Communist country, Kim wanted his school to include that training ground for future capitalists: an MBA program. During one of his trips to the capital in 1998, with North Korea in the midst of a famine that would eventually kill thousands, the state’s secret police arrested Kim. North Korean dictator Kim Jong Il didn’t lock up the educator for being crazy. He got it in his head that the oddly persistent American — who at the time, among other things, was helping to feed starving North Koreans with deliveries of food aid from China — was a spy. So for more than 40 days, Kim languished in a North Korean prison. An evangelical Christian, Kim wrote his last will and testament during those days, not knowing if he’d ever get out. Which makes where he plans to be in mid-September all the more astonishing. Kim will lead a delegation of 200 dignitaries from around the world to North Korea for the dedication of the first privately funded university ever allowed in the Democratic People’s Republic of Korea: the Pyongyang University of Science and Technology (PUST). The school will have an international faculty educating, eventually, around 600 graduate students. Kim dreams ultimately of hosting an industrial park around the PUST campus, drawing firms from around the world — a North Korean version, as bizarre as it sounds, of Palo Alto or Boston’s Route 128. There will be Internet access for all, connecting the students to an outside world that they’ve heretofore been instructed is a hostile and dangerous place. And among the six departments will be a school of industrial management. That the North Koreans are permitting this to happen — that they have given James Kim the nod to create his university, just as he intended — is remarkable. It’s hard for outsiders to understand just how backward, isolated, and impoverished North Korea is. Since the collapse of the Eastern bloc 20 years ago, fewer and fewer North Korean university students study abroad. Allowing PUST to proceed lets a gust of fresh air into a stilted, frightfully isolated environment. The rest of the story is worth reading here. South Korea permitted a delegation from a private foundation to visit North Korea this week to celebrate the completion of a science and technology university jointly built with the North, Seoul’s Unification Ministry said Monday. The ceremony for the Pyongyang University of Science and Technology is scheduled for Wednesday, according to ministry spokesperson Chun Hae-sung. He said the 20-member delegation will make a three-day trip to the North beginning Tuesday. The delegation includes Kwak Seon-hee, head of the Seoul-based Northeast Asia Foundation for Education and Culture. The foundation was mostly responsible for organizing donations and fundings for the university, the first to be jointly-operated with an organization not based in the North. The move marks the first time that the Seoul government has approved a non-humanitarian visit to the North since the communist state carried out its second nuclear test in May. 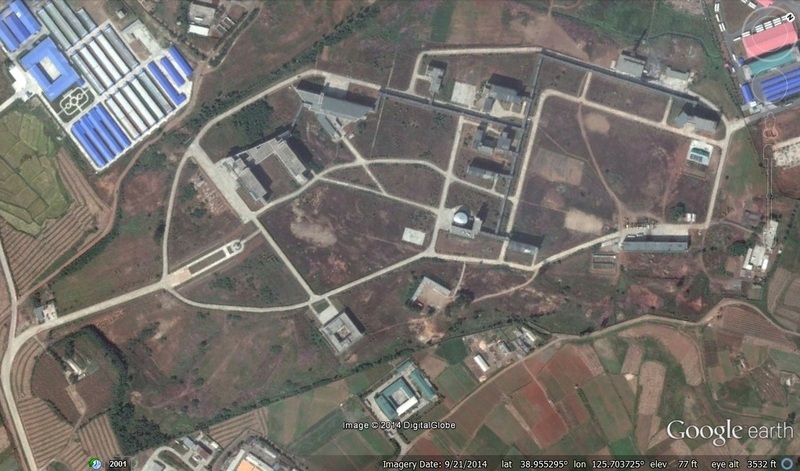 The date of the school’s opening and other administrative affairs, however, have yet to be decided and must be worked out between the North Korean authorities and the foundation. Kim Jin-kyung, head of the Yanbian University of Science and Technology in China, will serve as president of the university until its official opening, according to ministry officials. 1. Here are previous PUST posts. 2. Here is the location of PUST. 3. Here is the PUST Wikipedia page. You are currently browsing the archives for the Pyongyang University of Science and Technology category.